It was not that long ago Elk Grove Mayor Gary Davis was telling roomfuls of soccer moms and their kids at several City Council meetings that yes, the city would build a multi-million stadium for a Major League Soccer expansion franchise and numerous field for their kids to play on. In the last several months, talk of Mayor Davis' grandiose soccer scheme has all but dropped off the radar. So what has happened? Wells aside from Elk Grove losing out on the MLS expansion franchise - did they ever really have a chance - there are several possible explanations why this scheme has, at least for the time being, disappeared. For starters, perhaps sensing his vulnerabilities and having burned too many bridges with an increasingly hostile electorate, Davis decided not to seek a third two-year term. With Davis out of the race, who among the incumbents appearing on this November's ballot is willing to carry his mantle? As one of two new Councilmen, Darren Suen never has expressed any Davis-style gusto for the scheme. His colleague, Steve Detrick has at times flashed signals of interest, but faced with two challengers this fall, it is unlikely he will make support of the soccer stadium scheme as one of his reelection platforms. That leaves Davis' hand-picked successor, Vice Mayor Steve Ly. Though he possesses a mediocre, at best, intellectual curiosity, even Ly must realize Davis' scheme is a dangerous proposition for Elk Grove taxpayers or at least talk about it during his campaign is foolhardy. Then again, maybe we are giving the Vice Mayor more credit than he is due. With this being an election year, the three incumbents - Detrick, Ly and Suen - are treating Davis' soccer scheme like the crazy Uncle you tuck away in the attic when visitors come around. It would be terribly hard for the City Council to justify issuing bonds of up to $100 million when they could not even muster enough support of the place a local one-half sales tax increase on the ballot. While election year politics is putting the soccer scheme under wraps, for now, there are more elements to the picture. Consider the fact that the $35-million 12 field facility in Roseville is expected to open by 2018. According to the Pacer Valley Tourism agency, that facility expects to draw 25,000 annual room stays to the Lincoln-Rocklin-Roseville area. With its existing infrastructure of shopping and lodging, the Roseville facility will have already cornered the market if Elk Grove's plan ever comes to fruition. While the Elk Grove City Council keeps its fingers crossed that construction of the Outlet Collection in Elk Grove will resume in 2017 and perhaps open by 2018, the Roseville soccer fields will be up and running. Let's not forget that the City of Davis also has a large soccer facility as well. Though it does not have all the bells and whistles that the Roseville facility will have or those proposed for Elk Grove's scheme, it is established and is currently hosting tournaments. Of course, the proposed Wilton Rancheria Casino could be a game modifier, not a changer, in the competition for tournaments should Elk Grove build the fields. Even the Chairman of the Wilton Rancheria, Raymond Hitchcock, acknowledged their $400 million casino would not open for at least five years from today. All of this leads to another point worth pondering - is there an actual shortage of fields in Elk Grove? This has been one of the Davis' main talking points throughout his whole scheme - Elk Grove has more children in soccer than other communities, and there are not enough fields in the city to accommodate all the players. Along those lines, the Cosumnes Community Service District (CCSD) recently made a significant policy change on how fields, mostly soccer, were allocated to the various youth leagues in and around Elk Grove. Previously, the CCSD had the Elk Grove Youth Sports Association (EGYSA) perform that tasks. After hearing complaints that the EGYSA was favoring Elk Grove Soccer over other soccer and athletic leagues, the CCSD stripped them of that authority and brought that function in-house. At that meeting where the EGYSA was stripped of its power, several officers with Elk Grove Soccer spoke against the move. One of the speakers was Elk Grove Soccer's Board Member William Newsome, who is one of six candidates, including two incumbents, running for open seats on the CCSD. Newsome suggested that fields could be allocated to leagues based on the highest monetary bid. It has been suggested between the parks and facilities of the CCSD, The City of Elk Grove, and the Elk Grove Unified School, there is an adequate supply of athletic fields to accommodate all the youth and adult leagues. 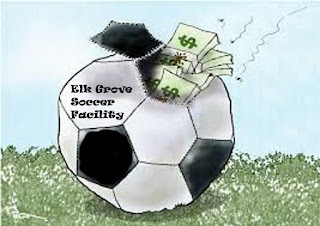 Readers may recall that Elk Grove Soccer's Chief Executive Officer Andrew Donnery made electoral threats to the Elk Grove City Council suggesting that if the city did not build the soccer facility, they would be voted out of office. There is one last point to consider, and that is the site of Elk Grove's proposed facility. The 98-acre parcel on the south side of Grant Line Road lies outside current city limits. To facilitate its development, Elk Grove has applied with the Sacramento Local Agency Formation Commission- to annex that parcel and several other hundreds of adjacent acres into the city. So if Davis's soccer scheme collapses, what becomes of that 98-acre parcel? Will it become a site of the Sacramento County Fair as some have suggested or will it become the site for several hundred more rooftops?